Our Company is ETB – Exhausts, Tyres & Batteries (Worcester) Ltd, a company registered in England with Company Registration Number 01532384. Incorporated on 4th Dec 1980. The Registered Office is Unit 15b Blackpole Trading Estate East, Blackpole Road, Worcester, WR3 8SG. References to “ETB, Exhausts Tyres & Batteries (Worcester) Ltd, Britannia Tyres or The Car Clinic ”we”, “our”, “us” and “the company” throughout the Terms and Conditions refer to this company. Our UK VAT Registration Number is GB 171 5560 13.
iii. To reach your local centre please see “Depot Locator” on our web sites for full address and phone numbers. iv. Please note ETB Group reserve the right to record telephone calls to our company for training purposes and to ensure the best quality customer service. Retail Division complaints: - We always try to do the best and fairest by our customers, but in the event that you are not satisfied with our goods or services in the first instance please contact your local store via the contacts page of our web sites. This procedure ensures we have a written copy of the complaint which is available to the branch Manager, the Regional Manager & the Retail Director and will ensure a fast, fair & amicable resolution. Below is a link to our ‘Contact Us’ page. General Retail Trading Terms and Conditions. If you have been given or have booked a specific MOT time slot, please be punctual or our ability to offer the MOT that day may be compromised. For Servicing, your vehicle should be with us one hour prior to appointment time please. You have the right to cancel planned work on your vehicle at any time before the instructed work has begun. There will be no charge for cancelled work provided no cost to ETB has been incurred. Where costs have been incurred you will only be asked to pay for the work completed thus far, or the cost incurred to date, payment of which will be required prior to the removal of your vehicle. Any deposits will be refunded where no costs have been incurred. We do not charge a vehicle storage fee under normal circumstances; however, storage charges will be applicable to any abandoned vehicles or vehicles not collected from ETB Group for a period of one month following completion of the work undertaken by ETB Group on said vehicle. For in-store or online customers alike, payment in full is required on completion of the work and prior to the removal of the vehicle. A 10% non-refundable deposit will be taken for special orders. For retail sales credit card payments must be made in person, credit card payment will not be taken over the telephone. All credit card data is stored according to the Information Security Policy of our merchant card service provider which is Lloyds Bank Cardnet. The Information Security Policy is reviewed and updated every twelve months. For wholesale customers please refer to specific wholesale division terms below. The company does not accept payment by cheque. ETB will dispose of removed parts (excepting warrantee & exchange parts) in accordance with current environmental regulations and legislative requirements. A fee may be charged for this service. Unless otherwise agreed with ETB Wheels which are removed from your vehicle to be replaced with wheels purchased from ETB will be left with you. Once fitted to your vehicle a tyre, wheel or any other part cannot be exchanged, subject to your statutory rights, which shall not be affected by this provision. ETB cannot offer refunds for any parts that have been used on your vehicle, subject to your statutory rights. If you believe that a tyre or wheel we have fitted is faulty, we will offer you the option of purchasing a replacement while the original part is sent to the manufacturer for analysis. If the manufacturer confirms that the product is faulty the cost of your replacement purchase will be refunded. 9. Updates to Terms & Promotional Material. ETB reserves the right to add, remove or amend the terms and conditions contained in this document without prior notice. ETB Reserve the right to add, remove amend or cancel any promotion, special offer or advertised price at any time and without prior notice. ETB reserves the right to add, remove or amend the terms contained in this document without prior notice. By continuing to use the website you agree to all the changes we make to these terms. to create or update your own or someone else's databases or use any manual or automated means to copy or monitor this website or its content. When you place an on-line order for goods or services from our ETB Group web sites, this constitutes an “offer” to purchase. ETB Group will send you an e-mail confirming your order, this constitutes the “acceptance”, irrespective of whether any payment that has been taken by ETB. ETB Group retains the right to refuse to accept your order solely at its discretion. If there is concern that there is an attempt to place an order dishonestly, fraudulently, by impersonating someone else or by attempting to use payment details which have been stolen, we will make additional checks and if appropriate involve external authorities. ETB require payment to be made in-store, for retail sales credit card payments must be made in person, credit card payment will not be taken over the telephone or on-line. The contents of this website (including without limitation all website design, text graphics, and all software code, and other material are the copyright of ETB or its technology providers. You may view this website and print or download any part(s) of it for personal use only. You may not copy, publish, reproduce, modify or sell any information or content obtained from this website without prior permission. Our sites may contain external links to sites operated by third parties. These links are provided for reference only and ETB Group is not responsible for the content of third party web sites nor does the presence of a link imply endorsement of third party sites or their content. Any use of said sites by you is at your own risk. All content provided on our websites is for information purposes only and does not constitute legal contract between ETB and you except in regards to orders for goods and services accepted by ETB. Materials published on our websites may include inaccuracies or typographical errors. All information is provided "as is" without guarantee of any kind and ETB does not guarantee that the information contained on these sites is accurate, complete or current. Information and materials on our web sites is constantly changing and ETB reserves the right to add, remove or amend web content without prior notice. All trademarks appearing on our websites are the proprerty of ETB – Exhausts Tyres & Batteries (Worcester) Ltd, its group companies, technical suppliers or other respective owners and should not be copied without the prior written consent of the owner. These terms are governed by and shall by interpreted in accordance with the laws of England and Wales. Only you and ETB shall be entitled to enforce these Terms and Conditions. No third party shall be entitled to enforce any of the terms. If any provision or part provision of this agreement is held to be invalid or unenforceable it shall be deemed modified to the minimum extent necessary to make it valid and enforceable. If such modification is not possible, that shall not affect the validity and enforceability of the other provisions of the agreement. Should ETB fail to enforce any of the terms, this shall not be construed as a waiver of any of the Company’s right hereunder. All offers are subject to availability. In the unlikely event we run out of stock of your chosen product ETB group reserves the right to offer you an alternative product of similar quality and value. All pricing on our websites is in pounds sterling and is inclusive of UK Value Added Tax. Unless explicitly stated otherwise, the cost of fitting tyres is included in the price. Other part, goods or services, where explicitly stated, may require a separate fitting quotation. Our websites contain a large number of goods and services and it is always possible that, despite our best efforts, some of the goods and/ or services listed on this website are incorrectly priced. Where goods and/ or services are incorrectly priced we may, at our discretion, either contact you for your instructions in relation to your order or reject your order and notify you of such rejection. ETB reserves the right, in accordance with these terms and conditions, to change the price of the goods. All quotations are valid for 14 days from the date of issue, unless they include a specific promotional offer which has an earlier expiry date. Once work has started you will be informed immediately of any additional work which may be needed. A new printed quotation will be produced on request and work will only be carried out with your agreement. When ordering tyres online for fitment by ETB, customers should verify the tyre size and specification currently fitted to your vehicle before placing the order. Please see the side wall markings of your current tyre, both front and rear. In the event that the incorrect tyres are ordered ETB will try to source the correct tyres and reschedule the fitting appointment if need be. The fitting of tyres will be subject to a visual inspection of your vehicle and tyres prior to the work starting to confirm that you have selected the correct tyres. Vehicle registration plate look up application is available for your use and as a guide only, ETB cannot guarantee the accuracy of this third-party information. ETB accepts no responsibility or liability for, any losses suffered as a result of any applications on our websites that are used by you to select the tyre sizes for your vehicle or by failing to provide the correct information for your vehicle. Nor do we accept responsibility or liability for any losses suffered as a result of any customers ordering incorrect tyre specification such as “Runflat , Reinforced , Winter” etc provided that nothing in these terms limits or excludes ETB’s liability for death or personal injury caused by its proven negligence. 14. Appointments/ Cancellation / Movement of Online Bookings and Available Today Products. No specific time slot for tyre fitting is offered, customers are seen on a first come first served basis. For our on-line customers convenience, a morning or afternoon preference is offered but does in no way guarantee a fitting time slot. Appointments can be re-scheduled to an alternative date (subject to availability) provided one clear working day is allowed between re-scheduling and the original appointment. In such cases please telephone or e-mail the local store in question. We make every effort to keep our local stock data accurate however “Available Today” products are not guaranteed. We advise customers to always call ahead to check stock is available before making the journey in-to store. Please make sure you arrive no later than 4pm for available today fittings or 3pm on Saturdays. You have the right to cancel any online booking without charge by giving written notice prior to the appointment day unless ETB has, with your consent, commenced the job and incurred cost. Guarantees apply from the date of original purchase. Any faulty part must be returned to ETB for inspection. Guarantees apply to the person who made the original purchase and are not transferable. Please ensure you retain your invoice, as proof of purchase and of your ID is necessary before work can be carried out under the guarantees. All parts originally purchased at ETB Group are covered by these guarantees. Parts failing as a result of fire, theft or criminal or malicious damage are excluded. Parts which have been used for motorsport, hire vehicles or taxis are also excluded. Guarantees do not cover any defect caused by reasonable wear, tear or corrosion, or any costs incurred through loss of use. Manufacturer’s conditions of sale apply to all goods sold. Your guarantee may be invalidated when parts are repaired by a garage or individual other than by ETB. Unless prior written approval has been obtained from ETB Management. ETB is not responsible for any part removed from the vehicle or adjusted by any person other than ETB. Guarantees do not extend to any monetary or compensatory claim for consequential or additional losses. All new tyres are covered against manufacturing defects throughout the legal life of the tyre. If a replacement tyre is necessary, only the tread used will be charged for provided the tread depth exceeds the minimum legal requirements. Tyres may have to be returned to manufacturer for inspection, in which case ETB will follow the standard procedure laid down by the British Tyre Manufacturers Association: - We will offer you the option of purchasing a replacement while the original part is sent to the manufacturer for analysis. If the manufacturer confirms that the product is faulty the cost of your replacement purchase will be refunded, only the tread used will be charged for. Is only available on selective brands. As an insurance product, terms and conditions are available separately at the time of purchase. On-line registration may be required to activate the warrantee. Vehicle wheel alignment is affected by road conditions and driving circumstances and therefore adjustment cannot be covered by an ETB guarantee. All Platinum Prestige Batteries come with a 3-years unlimited mileage guarantee. All Platinum Prestige Plus Batteries have a 5-year unlimited mileage guarantee which includes the labour required to honour this guarantee. Before any work can be carried out under the guarantee, we will conduct a full inspection of your vehicle’s charging system and if any defects with the vehicle which effects the battery are present, theses must be rectified before the battery guarantee can take effect. The guarantee will be void if you fail to authorise the fitting of all additional parts or work considered necessary to restore your battery system to its proper working condition. Hire vehicles, taxis and vehicles for commercial purposes or motorsports are not covered by this guarantee. We will guarantee all new brake parts fitted, including labour for the first 12 months or first 12,000 miles after fitment, whichever comes first. ETB will repair or replace at its discretion any defective parts and reassemble them on your vehicle free of charge. Before any work can be carried out under this guarantee, we will conduct a full inspection of your vehicles braking system and if any defects with the vehicle which effects the braking system are present, these must be rectified before the guarantee can take effect This guarantee will be void if you do not authorise the fitting of all additional parts or work considered necessary to restore your braking system to its proper working condition. All exhausts sold by ETB come with a 12-month unlimited mileage guarantee. Any part alleged to be defective may need to be returned to the manufacturers for inspection. We may also require customers to have their vehicle engine management system checked to ensure that they are in good working order. The natural surface deterioration of Chromed & Chromed effect exhaust parts is not covered by this guarantee. 8. Vehicle service and parts. We offer Full and Interim ETB menu service which may differ from a manufacturers service. All service parts or any other mechanical parts fitted are manufacturer original equipment approved components and are guaranteed for 12 months or 12,000 miles, whichever occurs first unless otherwise stated in these terms. We offer a 12-month unlimited mileage guarantee. Return your vehicle or part to the ETB centre concerned together with your original receipt and any other paperwork provided to you as well as proof of identity. ETB is conscious that you trust us with your private information which is necessary to process your order. Other than where stated within these Terms and Conditions and with our chosen payment card service provider, your information is not shared with any third party. Individuals may obtain details of their own data which is held and/ or processed by ETB. 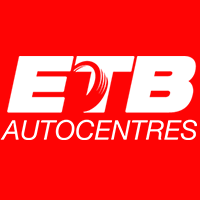 Requests need to be made in writing via e-mail to customerservice@etbtyres.co.uk. Please allow up to 28 days for a response. ETB reserve the right to charge an administration fee for unfounded, excessive and repetitive requests. Occasionally we may send you e-mail pertaining to our products and services. If you prefer that we do not contact you with further ETB information you may opt out by clicking on the un-subscribe button situated near to the bottom of any marketing e-mail or newsletter.